In December 2008 issue of the TASC magazine, Sylvain Vervoort guides us step by step in an entertaining tutorial of building a customized candlestick oscillator. Utilizing the Heikin-Ashi chart's consistency, it provides an overlay tool that allows for some discretion to help holding onto a profitable trade. Figure 1. 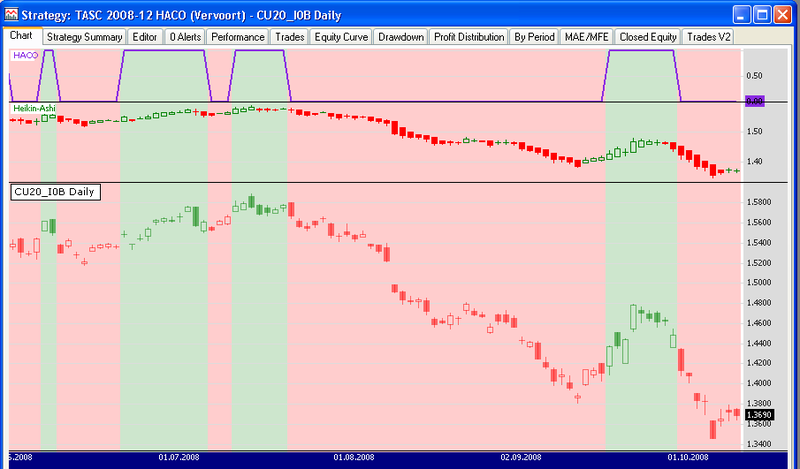 Here is how HACO was signaling about a downtrend in Euro in Summer'2008. The Heikin-Ashi Candlestick Oscillator (HACO), as presented by its author in this issue, is available to Wealth-Lab Developer/Pro 6 users. To power your chart analysis with HACO, just select «Extension Manager» from the Tools menu to update TASC Indicators library (open source).